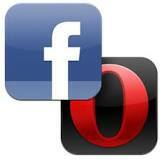 Firstly, launch your opera mini browser and login normally to your facebook account then open another tab and go to this link http://touch.facebook.com/buddylist.php? (make sure the question mark is included). Your online friends will automatically be displayed , just select anyone of them to start chatting.